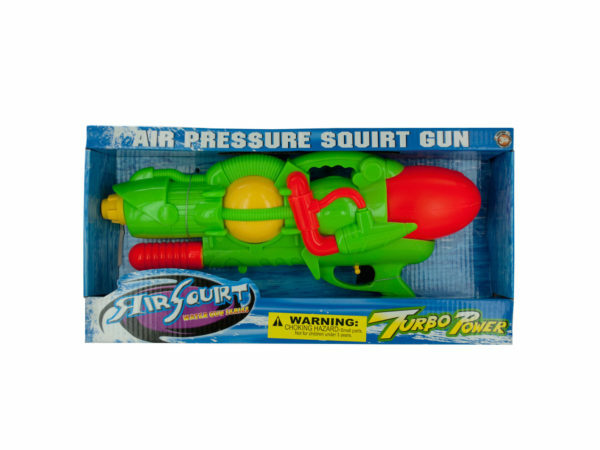 Blast away the competition with this Air Squirt Turbo Power Water Gun featuring a colorful plastic gun in a futuristic design with a water tank and pump action for a powerful stream. Fill the gun with water, pump to pressurize and press the trigger to shoot. Measures approximately 13.75" long x 6.5" tall. For ages 3 and up. Comes packaged in an individual window box. Box measures approximately 15" x 2.75" x 7.625". 3 pcs. 6 pcs. 9 pcs. — 12 pcs.